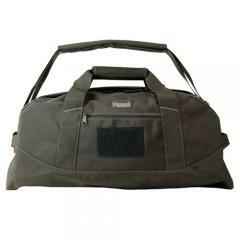 Travel conveniently and confidently with the BARRON Load-Out Duffel Bag from Maxpedition. Designed to get users anywhere in a hurry, the bag offers maximum storage space while still meeting the FAA carry-on bag size requirements. With spacious main compartments offering nearly 1500 cubic inches of storage space, the bag easily holds weekend and mission essentials. Constructed from water and abrasion resistant 1000-denier nylon, the bag provides the durability needed to go anywhere on the world and come back in one piece. Fill the main compartment with clothes or other gear and when that is full quickly load the front pockets with frequently needed items. Once everything is packed, two compression straps keeps items secured and provide last minute attachment points. A webbed grid on the bag's back allows for even further modular gear and accessory securement.